What an exciting addition to our Sharkfest Series! You will now have a chance to say "I swam the Golden Gate!" Swimmers will board a ferry in Sausalito. The ferry will transport you to south tower of the bridge and you will swim back past the north tower to finish at East Ft. Baker at Horseshoe Cove in Sausalito. This is a “Golden” opportunity! The event is limited to 300 participants and is sure to sell out so don't wait too long to register! INCENTIVES: T-Shirts for all participants. Sharkfest Swim Medals for top three finishers in each age group, in each division (wetsuit & non-wetsuit). Personalized award plaques will also be mailed to the first place finishers in each age group, in each division (wetsuit & non-wetsuit). PARKING: The best place for participants to park is Lot 4 ($5/all day) in Sausalito located on Bay St. just off Bridgeway in downtown Sausalito. There will be a shuttle bus from the swim finish back to the Sausalito parking lot after the race. Spectator parking is available and free at East Fort Baker (link to location on Google Maps). CANCELLATIONS: Registrations are non-refundable. If you can no longer participate in this event, you may receive a rollover credit (minus a $35 processing fee) toward a future event as long as you let us know by June 22 2018. After that date, a doctor's note is required to receive a credit. You will check-in on race day morning Gabrielson Park (next to the Sausalito Yacht Club). You will be required to show a photo ID to receive your timing chip & swim cap. You will also get your hands marked with your race number during check-in. We strongly recommend that you simplify by wearing your wetsuit (and a pair of flip-flops if you don't want to board the boat barefoot) and carrying your swim cap and goggles on the ferry. If you want to wear shoes or a sweatshirt, please grab a plastic bag at check-in, mark it with your race number and bring it with you on the ferry. You may put your items in this bag during the ferry ride and our volunteer crew will make sure these bags get back to the finish area. Restrooms are available at the Sausalito ferry dock. There will not be private changing facilities available, so arrive wearing your swimsuit. Where should I park? Where should spectators park? The best place for participants to park is Lot 4 ($5/all day) in Sausalito located on Bay St. just off Bridgeway in downtown Sausalito. There will be a shuttle bus from the swim finish back to the Sausalito parking lot after the race. Spectators can park in the dirt lot near the finish line between the Coast Guard Station and the Presidio Yacht Club. They must NOT park in the parking spots along the water's edge, nor in the lot designated for the Discovery Center. Yes you can wear a full body swim suit or skin suit, but if you do you will be placed in the "Wetsuit or Swim Aid" category as it is still considered to be a swim aid to help you swim faster. The "Non-Wetsuit or Non-Swim Aid" category is for those who wear old school swim suits only. No. We charter ferries to accommodate event participants. The ferry for this swim will be going to San Francisco after it drops off the swimmers at the south tower of the bridge and does NOT return to Sausalito. If your friends and family members rode the ferry, they would miss your swim finish. What do I need to bring for when I finish the swim? Bring a towel, warm dry clothes, shoes, hat and any other personal items that you may need when you finish. These items will be placed in a bag labeled with your bib number (or you can put them in your own bag and tag that bag with your bib number) and will be transported from the swim start to the finish. These are items you DON'T take on the ferry so that they will be waiting for you when you finish the swim. The Golden Gate swim course may have a notorious reputation, but we can assure you we've safely escorted swimmers along this course 6 times in years past. The biggest variable is the tides. Luckily, our race director, Dave Horning, has swum the course over 6 times and knows the San Francisco Bay tides well. We specifically plan the date of the swim in accordance with the tides. 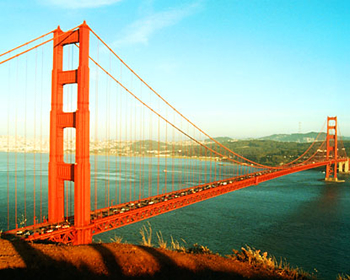 Once the race starts by the South Tower of the Golden Gate Bridge, You will aim for the North Tower of the bridge. The tides will naturally carry you under the bridge as you swim North. There will be a lead boat to follow across the "gate" and to the swim finish. You will be given instructions race day morning on which sights to spot off of during the swim. These instructions are based on a test swim conducted the day before during similar tidal conditions. Mind these instructions.